Add all ingredients (except lime juice) to 1 pot. Cover a cook for 20 minutes. 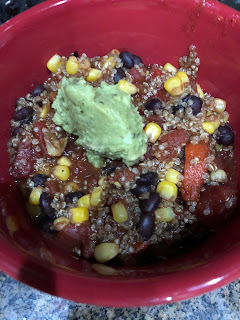 Drizzle with lime juice and serve with guacamole or avocado. You can eat it in a bowl or make tacos. 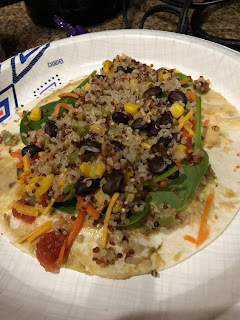 For the tacos: spread hummus on a tortilla, and top with shoestring carrots and spinach along with quinoa mixture. Fresh avocados, guac, and vegan sour cream are good toppings. Vegan cheeses, etc.